I’ve been putting off sharing this article with you not because it wasn’t important – it is. 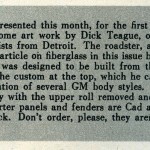 The article was printed just after a year when fiberglass cars were introduced in late November, 1951. I’ve been putting this article off because it’s an amazingly long and detailed article. 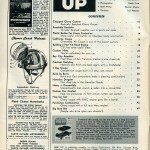 It’s only 3 magazine pages, but the type is so small in the original article it would compare to a normal 6-8 page article in any magazine – if the font size was corrected. Maybe larger. There are many historically important points raised in this article, and I’ll address those after you’ve completed the article below. But as you dig into the story, I think you’ll be fascinated with the detail – step by step – on how to create a fiberglass body from scratch. And this is the procedure for just the body – it doesn’t address what to do with the body once you’ve completed it. 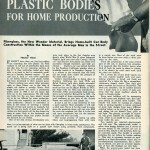 This article gives us a window into the times of how they built fiberglass bodies, molds, and cars. It’s pretty cool. So have at it gang and get some coffee and something to eat. You’re going to need it to make it through all parts of this article. But as I said before….it’s definitely worth it. It hasn’t been done yet, but hot rodders are expecting the first plastic ’32 Ford roadster to roll out of somebody’s back yard any day now. In car conscious sections of the U.S. that particular model and body style is as hard to find in restorable condition as a Stanley Steamer engine. 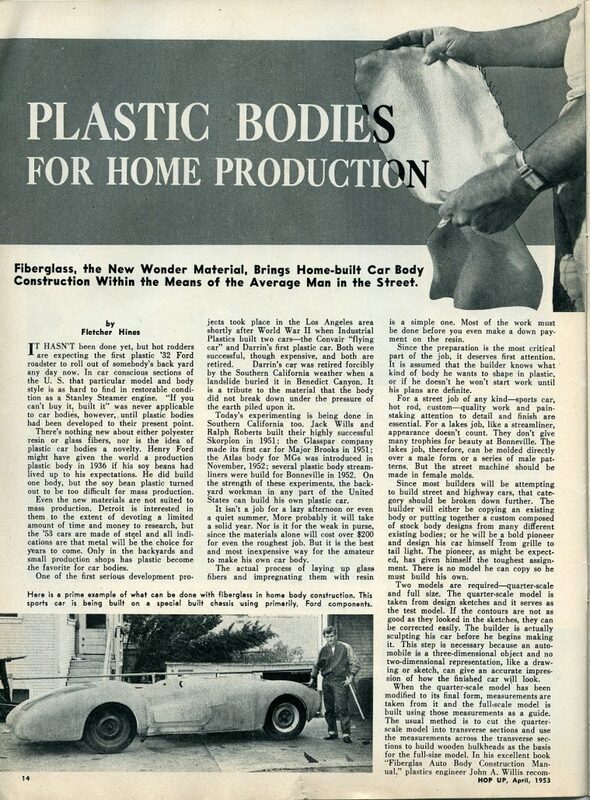 “If you can’t buy it, build it” was never applicable to car bodies, however, until plastic bodies had been developed to their present point. There’s nothing new about either polyester resin or glass fibers, nor is the idea of plastic car bodies a novelty. Henry Ford might have given the world a production plastic body in 1936 if his soy beans had lived up to his expectations. He did build one body, but the soy bean plastic turned out to be too difficult for mass production. Even the new materials are not suited to mass production. Detroit is interested in them to the extent of devoting a limited amount of time and money to research, but the ’53 cars are made of steel and all indications are that metal will be the choice for years to come. Only in the backyards and small production shops has plastic become the favorite for car bodies. 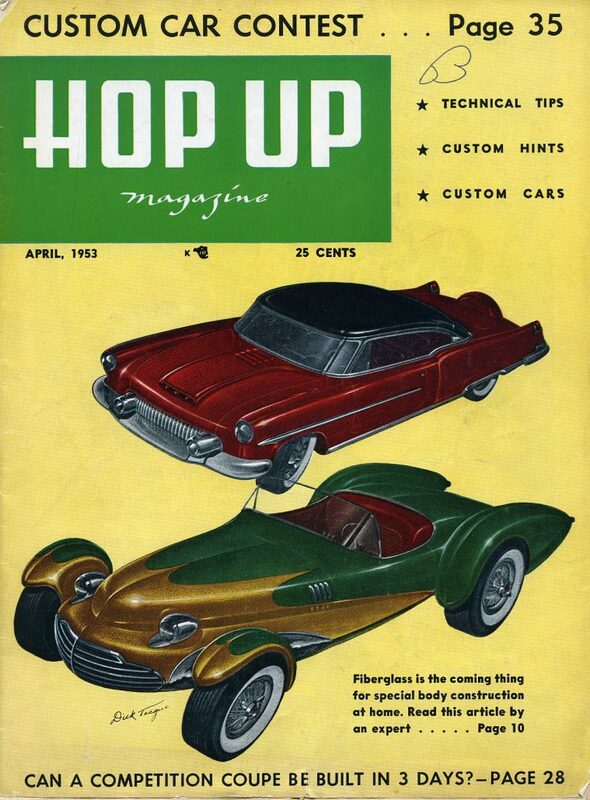 One of the first serious development projects took place in the Los Angeles area shortly after World War II when Industrial Plastics built two cars–the Convair “flying car” and Darrin’s first plastic car. Both were successful, though expensive, and both are retired. Darrin’s car was retired forcibly by the Southern California weather when a landslide buried it in Benedict Canyon. It is a tribute to the material that the body did not break down under the pressure of the earth piled upon it. Today’s experimenting is being done in Southern California too. 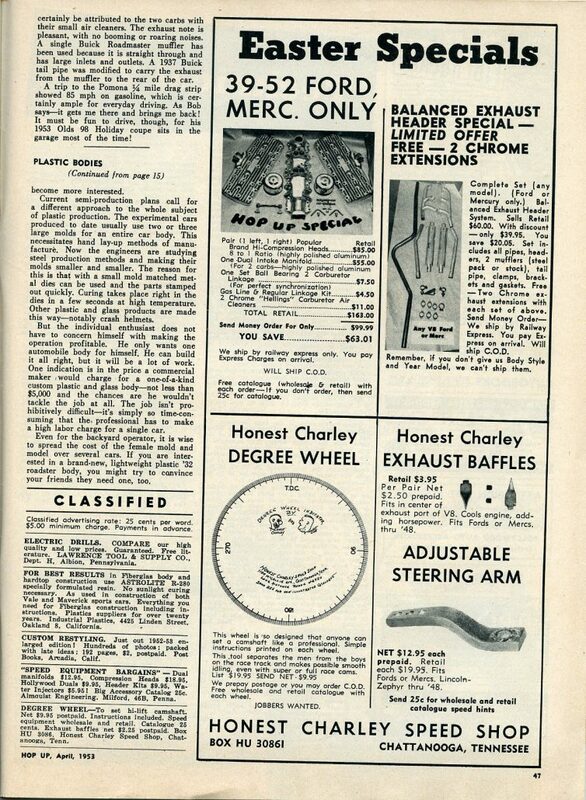 Jack Wills and Ralph Roberts built their highly successful Skorpion in 1951; the Glasspar company made its first car for Major Brooks in 1951; the Atlas body for MGs was introduced in November, 1952; several plastic body streamliners were built for Bonneville in 1952. On the strength of these experiments, the backyard workman in any part of the United States can build his own plastic car. It isn’t a job for a lazy afternoon or even a quiet summer. More probably it will take a solid year. Nor is it for the weak in purse, since the materials alone will cost over $200 for even the roughest job. But it is the best and most inexpensive way for the amateur to make his own car body. The actual process of laying up glass fibers and impregnating them with resin is a simple one. Most of the work must be done before you even make a down payment on the resin. Since the preparation is the most critical part of the job, it deserves first attention. It is assumed that the builder knows what kind of body he wants to shape in plastic, or if he doesn’t he won’t start work until his plans are definite. For a street job of any kind–sports car, hot rod, custom–quality work and painstaking attention to detail and finish are essential. For a lakes job, like a streamliner, appearance doesn’t count. They don’t give many trophies for beauty at Bonneville. The lakes job, therefore, can be molded directly over a male form or a series of male patterns. But the street machine should be made in female molds. Since most builders will be attempting to build street and highway cars, that category should be broken down further. The builder will either be copying an existing body or putting together a custom composed of stock body designs from many different existing bodies; or he will be a bold pioneer and design his car himself from grille to tail light. The pioneer, as might be expected, has given himself the toughest assignment. There is no model he can copy so he must build his own. Two models are required–quarter-scale and full size. The quarter-scale model is taken from design sketches and it serves as the test model. If the contours are not as good as they looked in the sketches, they can be corrected easily. The builder is actually sculpting his car before he begins making it. This step is necessary because an automobile is a three-dimensional object and no two-dimensional representation, like a drawing or sketch, can give an accurate impression of how the finished car will look. When the quarter-scale model has been modified to its final form, measurements are taken from it and the full-scale model is built using those measurements as a guide. The usual method is to cut the quarter-scale model into transverse sections and use the measurements across the transverse sections to build wooden bulkheads as the basis for the full-size model. 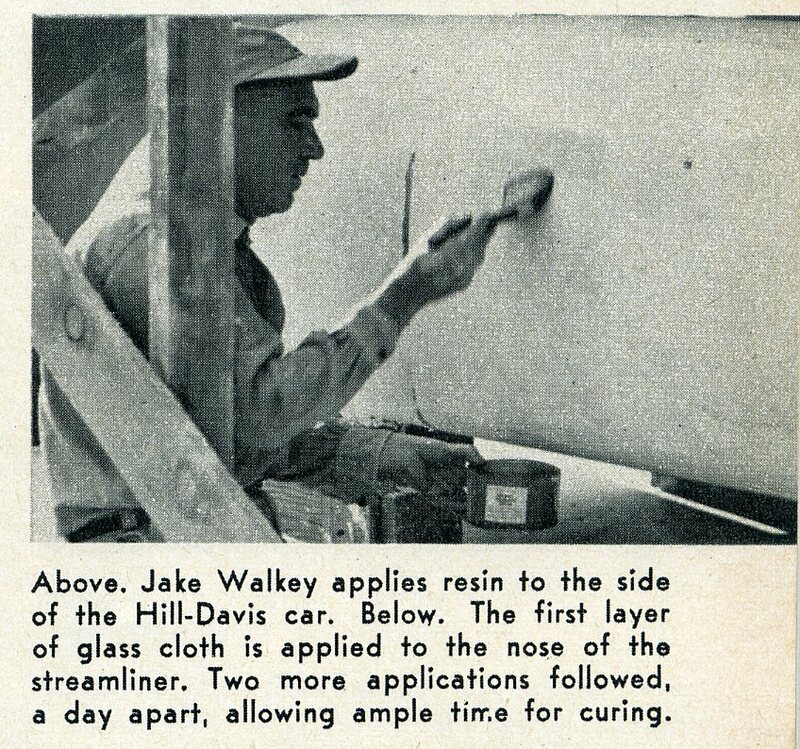 In his excellent book “Fiberglass Auto Body Construction Manual,” plastics engineer John A. Willis recommends that no less than ten cuts be made. Once the wooden bulkheads have been made, they are connected by wood or metal strips. Over those strips, fine-mesh screen is laid. Over the screen, the first coat of plaster is applied. Full details of the building of the model can be found in a number of publications. Minor changes can be made in this full-scale model if the car does not look quite right. When all the changes have been made, the model is finished to mirror-smoothness and a thin coating of auto body lacquer applied in a dark color. Any ripples or uneven spots in the surface may now be detected with ease. When the model is finished, the female mold is ready to be made. At this point, the builder of a completely original design has caught up with those who are using an existing car for a model. The first step in making the female mold is to coat the model with a parting agent. On a metal car, which presumably the owner will want to receive from you in the same condition he loaned it, a water-soluble parting agent should be used. On a model you have your choice of parting agents. Over the parting agent goes a polished coat of carnauba wax–one of the top-quality auto waxes will do nicely. Now the first coat of resin is sprayed on. Brushing or some similar means of applying the first coat, will enable the styrene in the resin to dissolve the wax on the model and make removal of the mold more difficult. The parting agent will still permit the mold to be removed, but it will not come off as easily as it would if the wax were still present over the entire surface. After the first coat of resin has completely hardened, the second coat is applied. This should be sprayed also. While it is still wet, the first layer of glass cloth is applied. Now the rest of the job consists of laying on glass cloth and mat and impregnating it with resin. When the desired strength and thickness has been reached, the mold is allowed to cure, then stripped from the model. Curing may take as long as two weeks, and if ordinary room temperature (75 degrees Fahrenheit) is all that can be used the entire two weeks should be allowed before trying to make the body in the finished female mold. 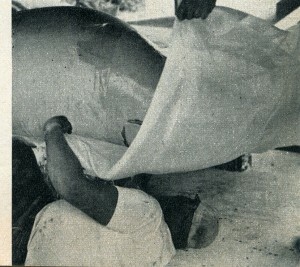 The resin will appear hard within a short time after it is applied, but curing will not be complete. The last 4 percent of the curing goes very slowly, and this small uncured remainder can cause warping of the entire shape. Curing does not begin until the catalyst is added to the resin. This is done in the shop at the last moment before the resin is to be used. After the catalyst is thoroughly mixed in, another compound called a “promoter” is added. The promoter and the catalyst react and give off heat to start the resin on its way to curing. If the mixture is left in the bucket it will harden in 45 minutes; on the model it will stay workable for twice as long. During the making of the female mold, and during the making of the body itself, it is important to saturate the glass cloth and mat with the resin. A rubber squeegee works very well. Wear your old clothes while you’re working with resin–it is gooey and sticky. Even experienced lay-up men get spotted with the stuff. When the female mold is finished, it must be sanded inside and coated with parting agent, then waxed. The condition of the interior of the female mold will determine the finish surface of the exterior of your car body, so smoothness is essential. While laying up the car body in the female mold, the mold must be carefully supported. Ordinary wood frames are usually constructed. These are connected to the mold only on its flanges, never on the shaped sections. All the strength of the body lies in the glass cloth and mat–the resin acts primarily as an agent to hold them in place. Contrary to some reports, the usual automobile body constructed of resin and glass is not stronger then a steel body. If the car is smashed, head-on at high speed into something like a concrete wall, the plastic will break where steel would bend and hold. Plastics engineers do not consider this danger sufficient to warrant building bodies thicker, however, since driver survival in a collision with a concrete wall is doubtful with any type of body. Two layers of glass cloth around one layer of glass mat is considered ample protection. 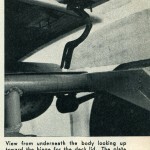 The resulting body skin is less than 1/4 inch thick and it weighs about one-fifth as much as the standard steel body. The lighter weight means better performance and more gas economy. In certain parts of the body, more layers of glass are used for reinforcement–points of attachment to frame, embedments, etc. Occasionally, when particularly large almost-flat areas are incorporated into the design, reinforcing material is added to those surfaces so they won’t warp. 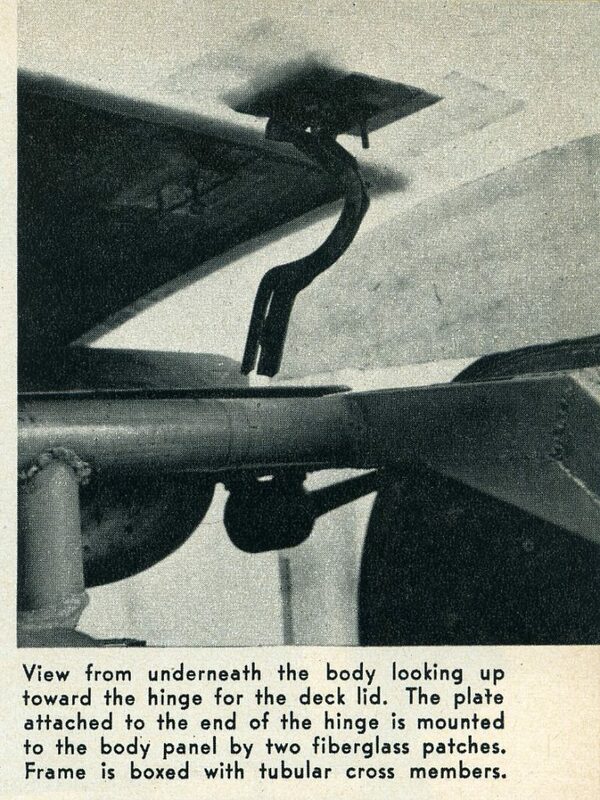 One of the good points about building with plastics is that the body can be reinforced from the under side after it has been completely built. Cloth and resin, added to already hardened plastic surfaces, will adhere perfectly. 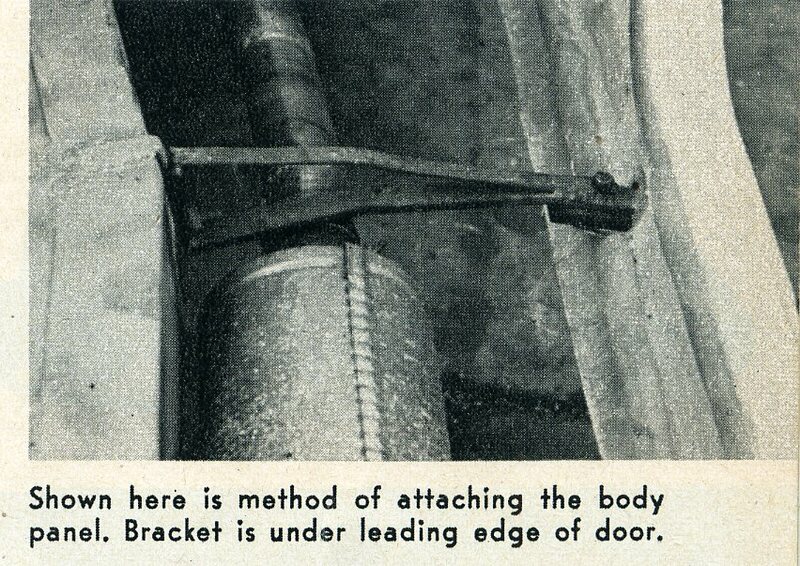 After the body is completely cured, it is trimmed, assembled and finished, just like any other car body. Auto body lacquer is recommended, after the surface has been sanded smooth and primed. This is when you will be more than grateful that you have used a female mold rather than molded directly over the model. The outer surface is as smooth and clean as the interior of the mold–the inner surface is rough and uneven, just as the outer surface would have been, if you’d tried to short-cut the process and not build the female mold. A new technique, called Hydro-Styling, offers a method of eliminating the model-building stage. 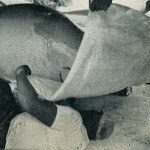 The contours are shaped by expanding a sheet of vinyl with water pressure. Body parts have been made with this method but no car has yet been completed. 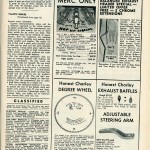 Information on the process may be obtained from James A Lampman, Coast Manufacturing and Supply Company, 4710 Crenshaw Blvd., Los Angeles 49, California. In the future, glass and resin construction of automobile bodies may become more widespread among manufacturers of small production sports cars. Reports indicate that some of the new Allard bodies will be made of these materials. There is, of course, Darrin’s new Kaiser-Frazer sports car, of which some 2,000 are reportedly to be produced. Muntz may go to plastic for his new bodies, and two California companies,–Vikingcraft and Glasspar–are together turning out about 10 car bodies a week. One thing seems definite–the future of plastic rests on its material cost. Present figuring is about $1.00 per pound of finished car body and this is enough higher than steel and aluminum to be prohibitive for quality production. If the price falls to about $0.60 per pound, bigger manufacturers may become more interested. Current semi-production plans call for a different approach to the whole subject of plastic production. The experimental cars produced to date usually use two or three large molds for an entire car body. This necessitates hand lay-up methods of manufacture. Now the engineers are studying steel production methods and making their molds smaller and smaller. The reason for this is that with a small mold matched metal dies can be used and the parts stamped out quickly. Curing takes place right in the dies in a few seconds at high temperature. Other plastic and glass products are made this way–notably crash helmets. But the individual enthusiast does not have to concern himself with making the operation profitable. He only wants one automobile body for himself. He can build it all right, but it will be a lot of work. One indication is in the price a commercial maker would charge for a one-of-a-kind custom plastic and glass body–not less than $5,000 and the chances are he wouldn’t tackle the job at all. The job isn’t prohibitively difficult–it’s simply so time-consuming that the professional has to make a high labor charge for a single car. Even for the backyard operator, it is wise to spread the cost of the female mold and model over several cars. If you are interested in a brand-new, lightweight plastic ’32 roadster body, you might try to convince your friends they need one, too. Here’s The Earliest Known Picture of A Victress S1. Shown Here At The Front Of The Car Is Jim Byers When He Was 29 Years Old. This is one of the best written articles in terms of the “state of the fiberglass industry” that I’ve ever had a chance to review. I wonder who “Fletcher Hines,” the author of this article, was? I’ll have to learn more about him soon. 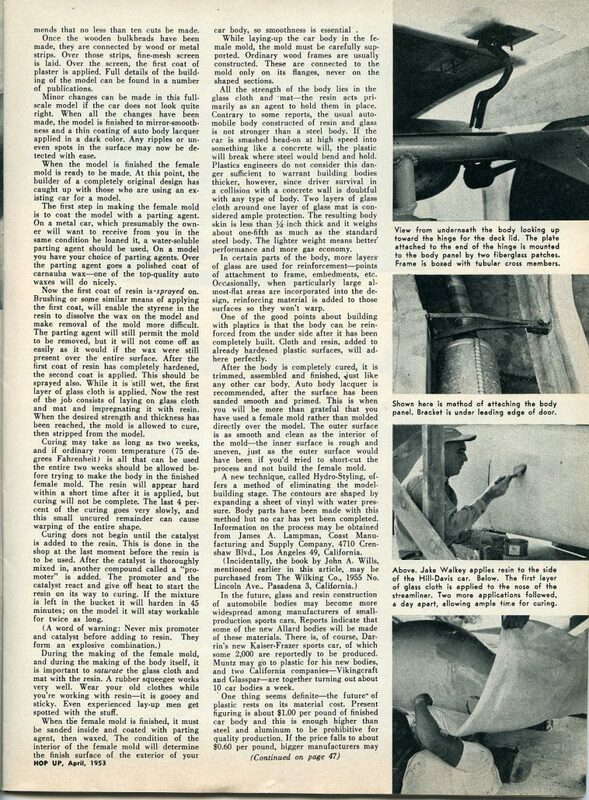 Very impressive article in every way concerning both production of a fiberglass body, and the discussion of the biggest “players” in the fiberglass arena in ’52-‘53. It’s interesting to note that the author felt that the first Ford ’32 fiberglass body would be produced soon – and he was right. Now…we just have to figure out which company produced it. LaDawri produced some 1930’s based Ford bodies in the ‘60s, but let’s see if we can find out who did the first ’32 or so Ford body in fiberglass. Another research challenge for you fiberglass guys out there! 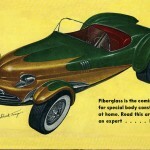 The “Industrial Plastics Company” of Oakland, California is mentioned as being a significant contributor to early ‘glass cars. 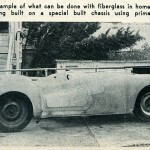 The first fiberglass Darrin car in ’46 was made by them (I didn’t know that), as was the flying car – the Convair – an early postwar fiberglass car too. 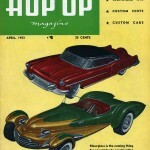 The article mentions that Darrin’s ’46 fiberglass car had been “retired” by the date of the publication of this article as follows: “Darrin’s car was retired forcibly by the Southern California weather when a landslide buried it in Benedict Canyon. It is a tribute to the material that the body did not break down under the pressure of the earth piled upon it.” Hmmm could the car still be hidden under a pile of earth? Does “retired” mean destroyed? I think so, and the Darrin family confirmed it as such, but if it “did not break down” during the landslide, then why was it destroyed? More research needed, but now we know (due to further research) that the landslide in Benedict Canyon occurred in January, 1952. 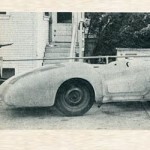 And because of this date, we now can confirm that the landslide did not destroy Darrin’s prototype sports car from late ’52 – what would become the Kaiser Darrin. It’s interesting that the author of this article “pegs the cost” of a custom shop building a fiberglass body from scratch at $5000 or more. 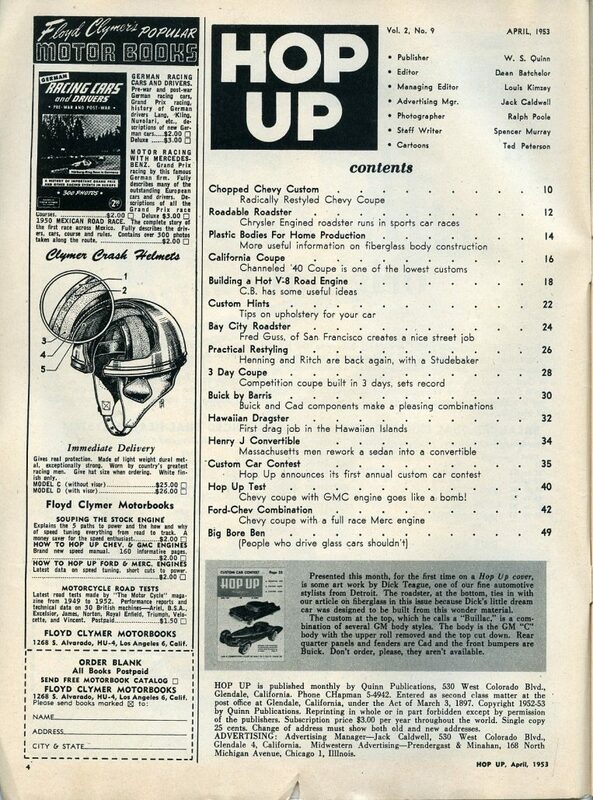 This was near the cost of having an aluminum body built at the time which was approximately $6000 at such shops as California Metal Shaping, on Tulip Street in Los Angeles, California. The earliest known picture of a Victress S1 body is shown, and it’s none other than Jim Byers, who worked with Doc Boyce-Smith early on in Victress, in the picture. Jim would have been 29 years old in this picture. 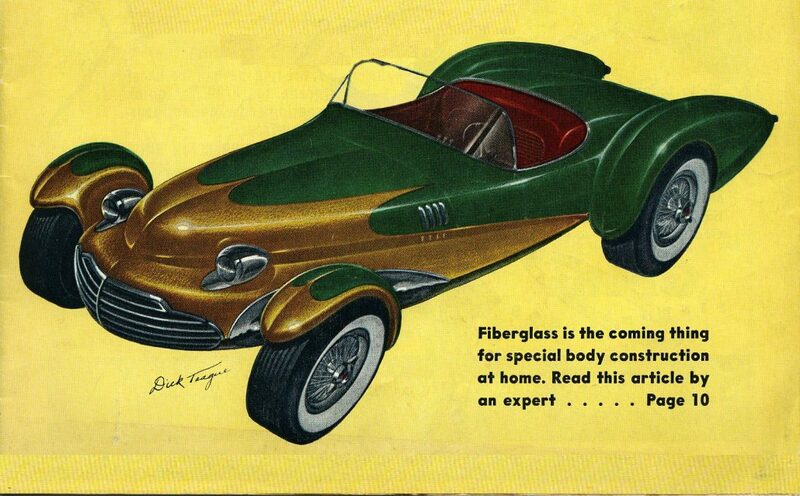 The beginning date for Atlas fiberglass body company (Burke, Thompson, Kinch) was confirmed as November 1952. I hope you enjoyed the article as much as I. 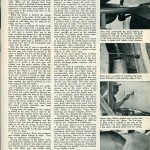 The number of new points distilled from the author and his thoughts as well are a great addition to our vintage fiberglass knowledge database – growing week by week. ~another tremendous article. thorough, interesting, and timely. 1954 – 1957 Mercedes – Benz 300SL GULLWING Fiberglass Replica MOLD! I’m having a hard time keeping up with my posting on each one..
That is a really great article, Geoff. I especially like the picture of Jim Byers with the Victress. 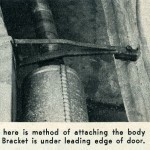 I would say that it is the first published picture of a Victress; we have the picture from Doc’s collection that shows Byers and an unknown person carrying a Victress body shell. Maybe you can post that for Victress afficianados. One comment on the laminating process described in the article, and in other articles I’ve read: the writer says that the water-soluble parting agent (polyvinylacetate, or PVA) is sprayed on first, and the wax applied over it. At Victress we waxed first, and sprayed the parting agent over it. With a well-waxed mold the wax would last for several bodies, and the parting agent would stay on the bodies when they were removed from the mold, to be hosed off before shipping. Frankly, I’d guess that waxing over PVA might tend to tear the fragile film, too.